Now renting Saturday to Saturday. Fantastic ocean views overlooking the pool from this spacious 1st floor, 3 bedroom, 2 bathroom oceanfront condo convenient to everything. Master bedroom and living room have great views from their sliding glass doors opening onto the oceanside deck. This clean & comfortable oceanfront condo sleeps 9. Master bdrm has queen bed, second bdrm has queen bed and a twin, 3rd bdrm has two twins, living room has a queen sleeper sofa. It comes fully furnished and close to many local attractions. Huge deck overlooking ocean.Pool is very close. One parking spot guaranteed, with a a few available but first come first served not guaranteed. Otherwise need to inquire about off street parking for another vehicle. I am from Santa Barbara , Ca and love Carolina Beach. I make sure my unit has great bedding, kitchen fully stocked with all that is needed, and local property manager who only manages my unit and a number to call if a problem occurs. I want the unit looking wonderful for my guests and hope my guests treat my unit as their own home. Ocean front , right on the sand, pool , large balcony , fully stocked unit! Large balcony on ocean facing ocean, beach front, ocean front first floor. One flat screen in master and one in living room. Central A/C, Two flat screen TV's, Cable TV's,stereo, dvd player, new paint, new bedding, ceramic tile kitchen floor. Full kitchen, microwave, dishwasher, washer/dryer. one spot for parking available with the condo. No Pets allowed. We stayed here for a week and had a great time. We have a family of 5 with 3 small children, so all the space from this condo was a necessity. The condo was clean and the kitchen was stocked with all the dishes and pots/pans you'd expect. The beach access is right next to the condo and it's a nice strip of beach, and the pool is a decent size. You are within walking distance to the Boardwalk with lots of restaurants and entertainment, so you are in a prime location. The parking situation can be odd. There are 3 cars that go into one lane, so you have the chance of getting stuck with cars on both sides of you. In the whole week, we didn't have any problems with this, but if you are the type that goes out and about a lot keep it in mind. There are a few extra spaces that anyone can use, but they fill up fast. There is a paid parking lot (not expensive) about two blocks away if needed. My parents stayed at a hotel nearby for a few days and used the other lot to come visit us. The only other negative is that you can hear your neighbors quite a bit. This can be an issue for light sleepers. Our neighbors weren't unruly at all. The normal sounds from neighbors next door and upstairs of walking around and watching TV can be heard. Overall we had a great time, and would stay here again. This unit is a very nice 3 bedroom unit set up for families. Great deck overlooking the pool with a view of the beach. Everything you need is there. Short walk to restaurants and down the street from the summer carnival. Great family vacation location. So happy you had a great time! It's a great place for families! Thank you for your kind review. Very clean space, with lots of room for a large family. Parking is a little bit of a pain with only 1 assigned space per unit. An additional vehicle is able to be parked in the building, but the space is not guaranteed. It is a bit of a burden to call and disrupt another tenant's time on vacation to come and move their car. Overall a nice place, with convenient beach access. We had a great week at Carolina Beach! Thank you for your review. I am so glad you had a nice time. We try to have the place in great shape for our renters. Parking is a pain at times on Carolina Beach as it is very crowded during the summer. Thanks again! Great location! 1/2 of the units were unoccupied during our stay or parking would have been a nightmare. The unit had all the essentials but was very cheaply appointed. The bed frames are not solid but sagging, the mattresses are not comfortable, the decor is extremely outdated. The patio would have been a nice place to gather had it not been for the 50 cent plastic chairs surrounding the table. The owner needs to spend some money and sprouted the place up a bit. No ice maker from the “new” fridge. Tv the size of a cell phone in the master. For the money spent , I expected nicer. The pool is awesome if you have children. But the condo is too close to it. So you hear everything. Oh, and be prepared to spend another couple hundred on top of your weekly for sheets and bath towels. And YOU have to put them on. Great location but will not be returning. Thanks for your review we appreciate the input. The beach is crowded and parking is typical in this area if you are coming to Carolina Beach. The beach is heavily populated as it is a fun place for families. .Furnishing in the unit are the onee in the pictures we have on line and are accurate. All the bedding is beach themed and new each year including pillow, bed pads, dish towels. The refrigerator, air conditioner, and stove is new and the unit is supplied with everything one would need for cooking and meals at the beginning of the season. We do not include sheets for beds as most people bring their own as it makes it more affordable for families to come which is our goal and they can have that option of renting bedding. Chairs were new on the balcony. VRBO is now charging the additional fee to renters as well as charging us for annual fees and payment fees so we try to keep our weekly fees reasonable so everyone can come to the beach as we are fully booked each and every summer. Your comments are appreciated and we really try to do a good job and think it is at a good price point. 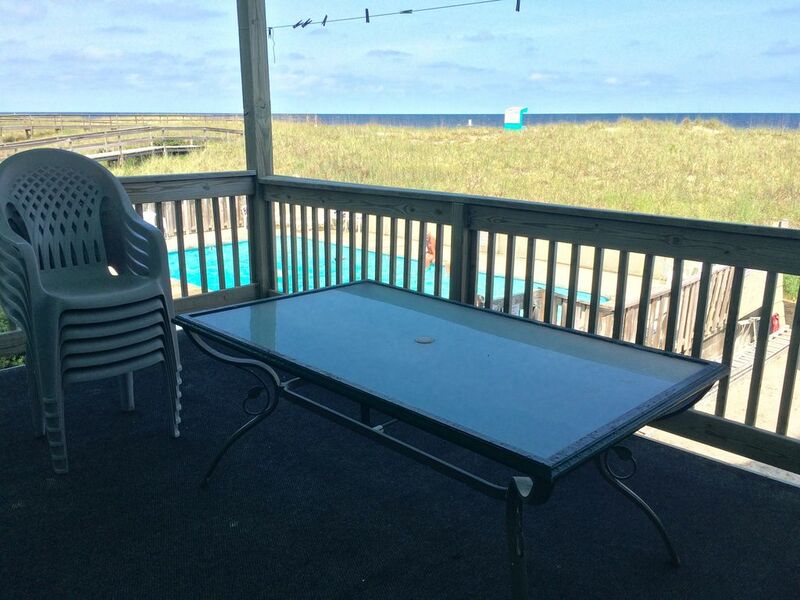 Large open porch with 6 person table easily fitting on half of it, with view of the ocean and pool. Unit is on first floor, so it's easy getting up and down to it. Living room/ dining area is spacious, and bedrooms are decent size as well. We stayed with 4 adults and three children (all 4 or younger) and had plenty of space. Beach access was a very short walk, which was (again) nice for kids. Close walk to lots of restaurant and nightlife options in Carolina Beach, including Britts Doughnuts. Pool access is also right there, and you could easily monitor kids in the pool from the porch. Would definitely rent again! The parking was horrible. People should know up front there is room only for one car. The parking is typical for the area and the ad does say 1 parking spot. Unfortunately, we only allotted one assigned parking spot and 3 spots in the parking lot are first come , first served otherwise you have to arrange for parking outside the building if you want to bring another car. Sorry for your inconvenience! Wilmington; Poplar Grove & Orton Plantations.